Ever wished your Apple Magic Keyboard and Magic Trackpad 2 were connected together in one seamless unit? Well, you might want to check out the new accessory for the Mac ecosystem which achieves exactly that aim. 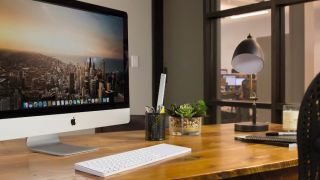 The MagicBridge (from Twelve South) is essentially a white polycarbonate case which Apple’s wireless keyboard and trackpad slot into seamlessly, with, naturally enough, holes cut into the frame in appropriate places to allow for access to ports and switches. The idea is that these peripherals look neater when joined up in a single unit like so, and it’s also easier to do things like operate your Mac from a distance with the MagicBridge resting in your lap – as opposed to having to balance a separate keyboard and trackpad in a precarious juggling act. There’s a degree of flexibility in terms of positioning, as well, because the trackpad can fit on either the right or left-hand side of the keyboard – which is handy for southpaws. The accessory is apparently very lightweight and obviously designed to match Apple’s peripherals, with silicone pads inside for the keyboard and trackpad to rest on, and also silicone feet underneath. Twelve South is selling the MagicBridge for $35 (around £28, AU$46) with free shipping in the US.